Who are we listening to here? Have they even tried the thing they’re talking about? The first thing I loved about the Away Travel Carry On was price. At $225 it’s a lot more than the $40 carry on I once used from Amazon, but it’s still less than half the price of many more popular high end carry ons. It’s worth noting that my old budget carry on eventually broke, didn’t carry a lifetime guarantee, spin on four wheels, have USB charging capabilities or compress my luggage, let alone conform to perfect airline bin dimensions. I bought my carry on as a two piece set, in combination with the full sized piece of luggage. At the time, I purchased the Away Carry On because it looked cool, but mainly because it had USB charging ports. 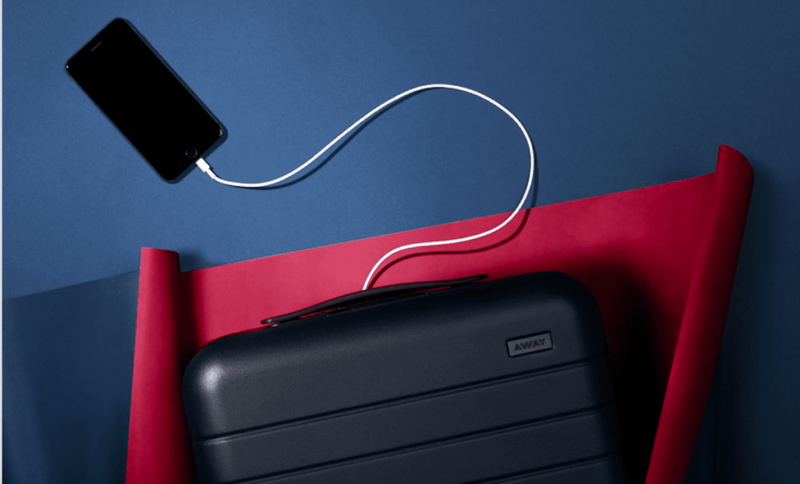 The case has a detachable rechargeable battery, and you can charge your phone or iPad off your case while in transit. Very. Handy. In 2017 people started to panic when word came down that airlines would restrict these style of suitcases, but Away has never been a part of any bans, thanks to its compliant, one snap design. In 3 years I haven’t had to take my battery out once, and if I ever do, it’s easy. When I opened mine for the first time, I was somewhat surprised by the material. I knew it was a semi hardshell, but unzipped and unfilled, it felt more giving and maybe even a bit more flimsy than I expected. It turns out, this is entirely by design and is the reason you’d need seriously impressive skills to ever crack it. Don’t judge it until you actually pack it and use it. The case is designed to protect your stuff via extremely durable edges but give enough to keep it from snapping. Ever. I may or may not have tried. I’ve shipped wine, glass and other valuables in it, and they’ve always come back in tact. Even better, the case does too. I can’t help but find it amusing when I see a $1000 carry on from a famous competitor which looks like it got stomped out in a prison riot after just a couple uses. A lifetime guarantee is great, but a carry on which doesn’t break is better. The wheels, handle and zip on the carry on have been simply remarkable. Even when jamming things to the brim the zip has always been extremely resilient and has never come closes to tearing. I literally always fit in more than I can imagine. The wheels are smooth as silk. As a four wheel spinner, I can have it up right or angled and it rolls straight, without any clicking, catching or slow down. You can quite easily copy this viral video at any airport. I do, regularly…. Properly packing a carry on is life changing, and I make every effort to always travel carry on only by rolling my clothes and maximizing my additional personal item. I personally use the standard sized version and the space is phenomenal. I know people love the oversize version, but I find the sizing just a bit too risky for me, since I occasionally end up on budget airlines with very tight margins and no sense of humor! Hot tip: When packing, always unlatch the toggle and spread them outside the case. Once you’ve finished packing a side: roll, push down and then pull the toggles over. When you pull on the tab you’ll compress your gear down as much as possible. This case has flown around the world more than 20 times, been in rain, snow, heat and frozen tundra and is still going strong. I actually find myself feeling bad for it when I walk over cobbled or bumpy streets, but it never seems to mind. The battery charges quickly. The charge lasts a long time and the storage and functionality is a treat. I’d try to think of something controversial to say, but my family likes mine so much, they bought their own. Check out the Away Travel Store, where our built in code gets you $20 off. I never found the appeal for Away. Their options are limited, the looks is very flimsy and cheap. I don’t think designer luggages are ideal either but the mid-range options, Tumi, Brics, etc just look and feel so much sturdier.